Jahmal Cole greets Tessie Udegboka from Nigeria on Tuesday. 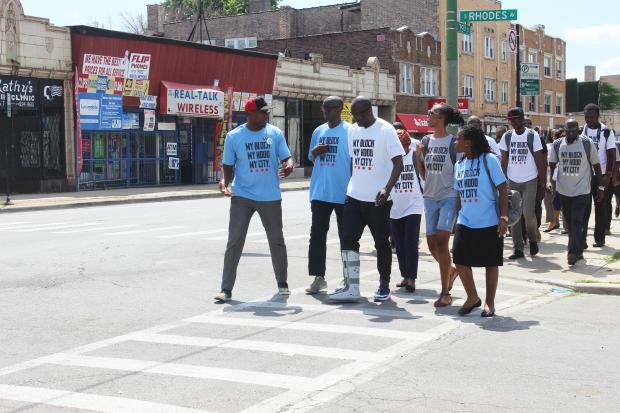 My Block My Hood My City group walks down 79th Street in Chatham with African entrepreneurs who are a part of the Young African Leaders Initiative Mandela fellowship. He said he met a man from Senegal who wants to work with his group. "He’s very passionate and wants to connect," Cole said. "We want to get My Block, My Hood, My City teenagers in Chicago to take a trip to Senegal, and he wants kids from Senegal to take a trip here." Cole said he wants to find ways to raise money this year, but it's too early to put a date on the potential trip. The visitors, mostly in their 20s and 30s, were selected to participate in the six-week Young African Leaders Initiative Mandela fellowship. They take classes, network and get help structuring their business plans. Meagan Keefe, Northwestern University’s African studies associate director, said she wanted the travelers to experience all of Chicago. Her colleague told her about Cole’s group. Keefe said she wanted to see if he could do something similar with their fellows. She said she hoped that the foreign visitors saw Chicago as it really is — and not what they see on the news. “I think much like people’s perspectives of Africa, it’s the same for some of them,” Keefe said. Angela Nzioki traveled from Kenya, where she lives, and said she has only heard about Chicago’s crime. After her first trip to Chicago, Nzioki said she understands that the city is more than what has been portrayed in media. Chatham looked like home, she said. "The South Side of Chicago looks a lot like Kenya," Nzioki said.“Like an onion, when you strip down the onion and get to the core of it, you’re reminded that it’s normal people with normal struggles, challenges and happiness." For 35-year-old Kacy Mbah of Nigeria, coming to see the South Side was important. She said she followed the story of Tyshawn Lee and has heard about the other shootings, but she wanted to see the side the media doesn’t always portray. “I know it’s an ongoing struggle about what the media paints,” she said. “Deep down there really has been no fear. I hear, but I’ve never felt that I would be unsafe being here. I know what it feels to be black. "I’m loving it, and I feel at home," she said. Before this fellowship, Tessie Udegboka had traveled from Nigeria to the Chicago three times. She said this visit was different because of the people she met and the trip to Chatham. Cole said he had the group walk east on 79th Street from King Drive to Cottage Grove because he wanted them to see a part of the South Side for themselves. 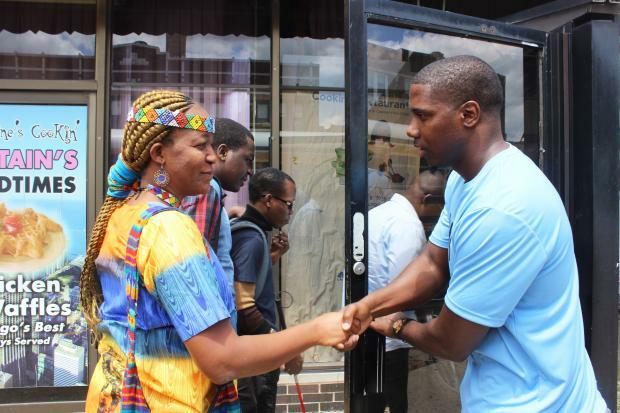 Victor Love, co-owner and president of the 79th Street Business Corridor Association, said he was on board to open his business to the African tourists because he wanted to showcase a successful black enterprise. “We’re tired of the negative images in which Chicago is being portrayed, and there’s always another side to the story,” he said.